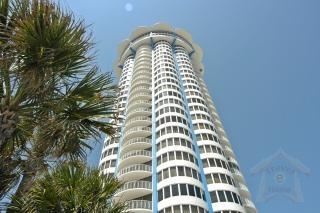 Gorgeous ocean view/river view condo on the 18SW floor of the Amazing Peck Plaza building, in Daytona Beach Shores. Sleeps 6 comfortably. 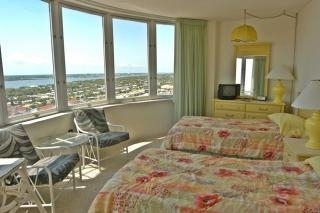 Fully furnished condo, master bedroom has a king size bed and two twins in the 2nd bedroom. 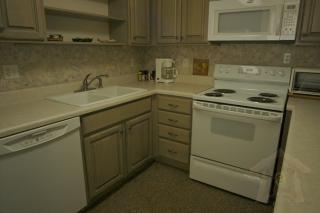 Kitchen is fully-equipped with utensils, pots & pans, coffee maker, toaster, microwave and more. Washer/dryer in unit. Living/Dining room combo with pull out sleeper sofa. Water/Garbage/Electric/Basic Cable/Internet/Phone w/ unlimited long distance calls to US and Canada all included in rent. Amenities: World class amenities are second to none. Spend your afternoon’s catching some Florida sun, or playing in the waves of the Atlantic Ocean on the “Worlds Most Famous Beach. 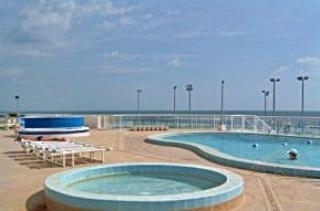 On the two- level sun deck you will find the ocean front swimming pool, bubbling hot tub, kiddie pool, lighted tennis court, basketball court, shuffle board and plenty of room and chairs to sun bathe. Secure underground parking as well as outside parking. In the clubhouse you will find a billiard room, ping-pong tables, library, two saunas and private exercise room. Found on site is the Top of Daytona Restaurant and Bar located on the 29th floor enjoy Happy Hour from 4-7 daily and 360 degree views of all of Daytona Beach Shores! Activities and Attractions: Surf\'s up in Daytona Beach Shores! Along with awesome waves, the area is best known for Daytona\'s International Speedway, The Kennel Club and Poker Room, Daytona Beach Ocean Walk and Boardwalk being home to Florida\'s tallest lighthouse (203 steps to the top!) down in Ponce Inlet, and a marine science center with interactive exhibits, a boardwalk, observation tower and nature trails. DBS is only a short drive east of many popular Orlando park destinations like Walt Disney World, Epcot, Universal Studios and Sea World. Updated Fishing Report: Ponce Inlet redfish school for their annual spawn at the Inlet and in the Intracoastal Waterway around New Smyrna Beach. Trophy bull redfish over 40 inches in length and weighing 20-50lbs are routinely caught during this time frame. Sight casting redfish schools dominate New Smyrna redfish charters, with the opportunity to catch dozens of redfish with lures, fly tackle and live bait. The Marine Science Center offers an experience where visitors can see some of the rich marine life of the area. One of the main goals of the Marine Science Center is sea turtle rehabilitation. Guests can overlook seven turtle hospital pools from the Turtle Terrace, located in front of the main facility. The MSC turtle rehabilitation area also includes care and treatment of freshwater turtles and land tortoises. There is also a gift shop where you can buy books and posters. Ponce Inlet Jetty- The Jetty is an outcropping of rock built up at the south end of the Daytona Beach Peninsula, which stretches about half a mile into the Atlantic Ocean. A paved walkway lets visitors walk out about half the distance of the Jetty to sightsee or go fishing. Dolphins can frequently be seen from the Jetty. The surfing is smaller than nearby New Smyrna Beach but has a nice swell. Ponce de Leon Inlet Lighthouse and Museum: Tallest Lighthouse at 175 feet (the second tallest in the US) sits at the end of the road south of Daytona Beach. It is one of only 10 lighthouses in the nation designated a National Historic Landmark. 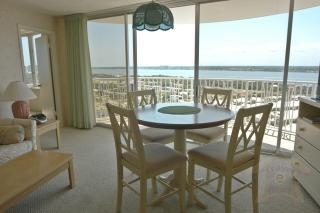 Climb the winding staircase for beautiful views of the Atlantic Ocean and the Halifax River. The lighthouse keepers\' dwellings and other historic light station buildings are now home to a lighthouse museum, which features exhibits on lighthouse life, local history, lighthouse and Fresnel lens restoration, shipwrecks, and the lighthouse keepers and their families. Lighthouse Point Park (County) - The park consists of 52 acres of pristine land at the south end of the Town of Ponce Inlet. The 52-acre park features fishing, nature trails, an observation deck and tower, swimming and picnicking. A variety of wildlife call the Lighthouse Point Park home, including raccoons, possums, skunks, armadillos, shore birds and birds of prey. Open daily 6 am to 9 pm. All funds due 30 days before occupancy, 12.5% Florida sales tax, $25.00 Booking Fee, $500.00 Refundable Security Deposit after inspection, $125.00 Cleaning Fee. 1 week minimum rental.